The Directorate of Social Services and Women's Work is involved in four major areas. The Evangelical Lutheran Church in Tanzania (ELCT) Health Directorate is operating under social Services and Women Work Department. It deals with health services delivery with a "wholeness" approach hence taking care of the body, soul and mental needs of man. The ELCT has 24 Hospitals and up to 148 health centers and dispensaries. Among the 24 hospitals there are three District Designated Hospitals (DDH); three Council Designated Hospitals (CDH); Zonal referral hospitals and a wide range of Community Based Health services including programs for HIV/AIDS control, Primary Health Care, Palliative Care and Home Based Care complemented by a network of Community Health Workers. The health facilities owned by ELCT provide about 15% of the national health services. The Health Directorate vision is to have a healthy society with healthy individuals and communities whereby physical, emotional, mental and spiritual needs are met and balanced,resulting in peaceful and joyful life. The Health Directorate mission is to witness and glorify God through provision of holistic equitable, affordable, accessible and sustainable quality health care services, in partnership with community and other stakeholders. Coordination, facilitation and capacity building. It involves also facilitation for effective planning and implementation of health services and programs. Management and good governance is part of this facilitation. Human resource planning and development including training. Technical and essential health services support. Policy harmonization, operationalization and monitoring. Our late President and father of the nation, Mwalimu Julius Cambarage Nyerere, once said, ''The best approach to assist poor persons is by educating their children.'. To him, this was one way of ensuring that there is equality in sharing resources that are aimed for poor nations. Historically, the ELCT is among the founders of education in Tanzania, as our involvement in Education can be traced to the time the Churches were instituted in the country. In the mid 70's schools were nationalized. Since that time, the focus of the church has been in secondary education and vocational training. Higher Education Colleges and University. At present, the Government is on a program that aims at increasing enrollment of pupils at Primary Level. The Program includes financial support in terms of student fees and institutional physical resources. ELCT runs more than 50 Secondary Schools, about 20 vocational training Institutions, 2 Colleges of Teachers Training and 1 university with 3 Colleges. Through its Educational institutions, ELCT aims at keeping together learning and faith in god. The state of education in Tanzania has gone down over the last few years. Many eligible children are out of school mostly because of lack of fees. This has made our illiteracy level to come to 26.4% with that of female youth illiteracy standing at 13% while that of male stands at 8%. Our involvement in many pre-schools that are managed by our parishes, as well as in other levels of education, is a move to participate in the eradication of poverty. 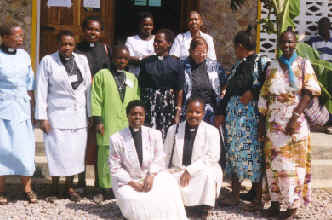 The decision by the national church to ordain women was made in 1990. To date, there are still some dioceses that have not ordained women. In some of these dioceses, the issue is a big one in the sense that discussion about it is minimal. Gender Training Sensitization. This has been done for Bishops and General Secretaries of Dioceses. Leadership Training for Women. This is a 10 weeks course that is conducted yearly. Counselling courses. These are conducted yearly for women leaders. English language courses. These are conducted for women leaders subject to the availability of funds. This program is at present located in the Health work of the church. Its focus is to enable and sensitize each parish to take care of people in their locality with special needs - people whose numbers are on the increasing due to various social and economic reasons. Special attention is given to people with disabilities. Advocacy work is also done on their behalf.